Update: That’s a wrap! Thanks for a fantastic PlayStation Experience. See the full opening keynote below, and stay tuned for all the panels heading to YouTube on Monday. Just a few more days until PlayStation Experience takes over Las Vegas! 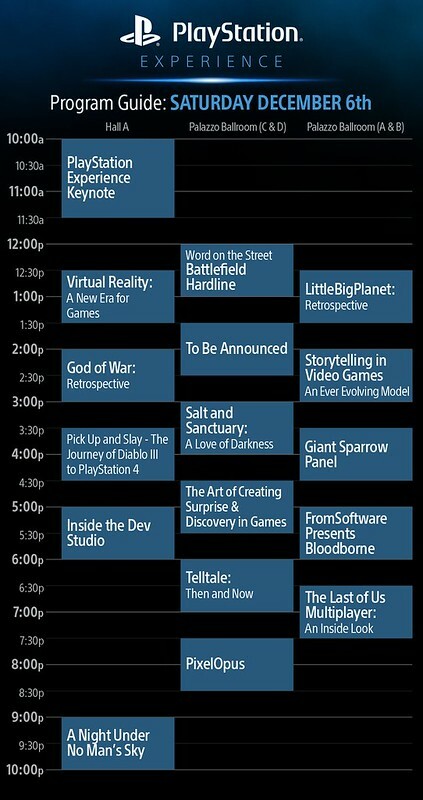 As promised, here’s the full schedule for panels for on-site PlayStation Experience attendees; see below for our planned livestream content schedule, which we’ll be streaming live on Twitch.tv/PlayStation. Protip: You definitely won’t want to miss the opening keynote presentation at 10am Pacific Time Saturday. Important note: The “Story Time” panel for 5pm PT Sunday has a new location. Please find it at the stage located towards the back end of the show floor. It is no longer in Hall A. Stay in touch for more details at official PlayStation Experience headquarters as we move into a historic weekend. See you soon! Thanx for the schedule. Flight leaves tomorrow at 3, really looking forward to it, see you there. Let’s do it eh? LET’S DO IT! Sweet, more VR info! Wish I could make it but I’ll be watching live streams for sure! Do you have Bloodborne livestream? Bloodborne won’t be streamed – but it will be playable! Will we be able to watch this through”Live from PlayStation”? If not can you set guys set it up to do so? Can’t wait for all the news and videos. Wish I could be there. Here’s hoping for a release date announcement for The Witness. No Vita. There’s nothing for it. Blogcast ended up dissolving due to the nuttiness of the event, but Clements will be on Beyond! I’ll be there! wll this be available to watch in Live Event Viewer? My fiance can’t go and wants to know the best place to watch everything! I’m assuming these times are Pacific, right? Yep! Updated to make that clearer. All Pacific Time. I hope Sony will say something about a Legend of Dragoon sequel release. INJECT IT INTO MAH VEINS SID!!! INJECT IT!!! When will Mortal Kombat X be shown? Mortal Kombat X will sadly not be on the livestream. We tried! Still dying to play it… it’ll be hands-on here in a big way though. This looks awesome!! I’m especially excited to see more of The Witness, No Man’s Sky and Axiom Verge :D Can’t wait! I’ve been with this family for 20 year’s so there’s a lot to watch and enjoy. Thank you for streaming all of it, not just the keynote. I’ll watch as much as I can. Would love it if all keynotes were recorded and archived for on demand viewing, Or released as a bluray or bluray set at a later date to be sold to those who couldn’t attend. What are the odds of making this happen? The Experience looks amazing from that line up. I am happy with my PS4 and PS4, but I hope that there are some announcements for Vita games (and not just one or two). I want games like Infamous, GTA, NHL, NBA…. Stand alone Vita games (not just remote play). Does anyone know where we are going to be able to purchase the 20th anniv. PS4? Watch the keynote at 10am Pacific Time on Saturday for details! Would I be setting myself up for disappointment if I went in expecting an E3/Gamescom press conference type of deal? It’s a production, that’s for sure! I’m surprised with how much the IGN Podcast Beyond shmucks bash Sony lately that Sony would carve out time for them. Guess it benefits them to do it. Will we be able to watch the live streams on PS4 or PS3? You guys are screening The Interview? Hopefully North Korea doesn’t shut down the PlayStation Experience. I can’t wait for the new era of gaming experience to arrive…. Virtual Reality has always been the future of gaming and I am so happy that this is not too far away. Having seen EMAGON trailer…the setting in the forest, somehow i feel it would be amazing to walk in it and I believe this is what the trailer is hinted at..VR experience. Sony Experience wants us to Experience Most Amazing Game On Nextgen (E.M.A.G.O.N) I am only sad that human’ lifespan is short and we won’t be around to experience PS8 or PS9 ….What an amazing experience that era of gaming would be….how much VR would have evolved then. I want to see the Crash Bandicoot 1, 2, 3 & Tag Team Racing Games being remastered, because there’s a possibility that they could be revived. I just love the nostalgia of these games, as these games really meant something back then, and it would be absolutely perfect if Naughty Dog remastered these games. There is a massive amount of potential for Naughty Dog, because these games in particular defined just how games should be made, and if they can pull it off well the first time round, then they’ll be able to bring the Crash Bandicoot PS1 Trilogy back with a bang!!! Please Naughty Dog, these games deserve to be made for PS3 & PS4, and it would make everyone’s Christmas absolutely special :-). I will watch the Keynote hoping that the Vita finally gets the attention they previously spoke of. Slightly disappointed to not see some sort of Polyphony Digital or Gran Turismo panel, as I had heard Yamauchi-san was in town for the event. Fingers crossed it’s the TBA panel, but I doubt it. I’m assuming (yes, I know what assuming does) that’s Uncharted 4’s block. Please give us some Vita titles to look forward to. GTA, Grand Tourismo, Syphon Filter, inFamous, Godeater Burst, Gravity Rush 2, God of War, Uncharted GA 2, or some JRPGs. I’m not counting on it because we have been let down so many times in the past but I can always hope for the best. @airJordan_Xx Uncharted is already HD, so it would just be the Uncharted Collection, not Uncharted HD Collection. Man, it looks like a bunch if boring stuff. I just want the game announcements. And i hope most are 2015 titles. Sick of waiting for good games. And sick of games not working on day one. Heard Capcom was going to be there… Would they reveal something besides RE Revelations 2? You guys aren’t streaming the how to become a game designer?!! DISAPPOINTED! 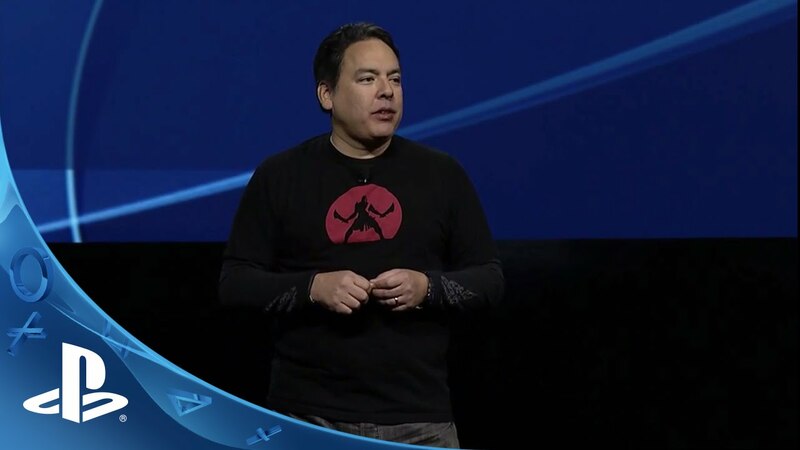 And are you guys going to announce God of War IV?!! Technical limitations. But it’ll be available after the weekend ends! Excited for David Jaffe’s new game! I also can’t wait to watch streams as much as I can! No Man’s Sky!! Can’t wait!!! Yep!!! Coming all the way from Wisconsin!!! See you there! Looks very, very ,very fun. I’m Jelly. But then there is PAX. I thought the BlogCast live was happening?